Tacos are great. I don’t think many people will argue with that statement. So many new taco joints have opened up in Pittsburgh in the last 2 years that I really can’t keep up. One of the most adventurous with their food would be the Richard DeShantz Restaurant Group’s täkō. Having eaten here a few times now I can say the tacos are really good. Lots of flavor in the meats and sauces used in each combination. The salsas and guacs rely on the the ingredients to create a taste rather than aiming to just be spicy. The margaritas were available in more traditional flavors and interesting combinations. At this point, living in Pittsburgh and other places, none of this is new to most people. However, my favorite thing täkō serves is the rotating list of specialty tortas at lunch. I will go so far as to say they are some of the best sandwiches I have eaten. 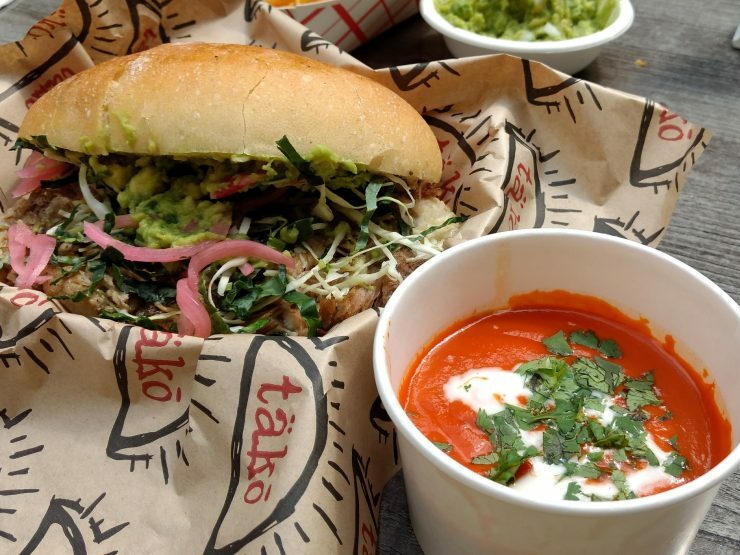 This love for their tortas started last winter when täkō had a booth at the Holiday Market in Market Square. This was obviously a test to see if people would be interested in täkō for lunch. I probably ate at the booth 5 or 6 times in the month it was there. The short rib torta was easily my favorite of the 3 available for the month. Then the month ended, the Holiday Market closed, and I was left without these tortas for lunch. It was a sad time. My friends and coworkers would confirm I was disappointed. When täkō announced they were opening for lunch this past Spring, I was so excited. The ability to order takeout from the outdoor bar is fantastic. A quality sandwich is ready in less than 10 minutes. They might not look too large, but the torta is overflowing with meat, sauces and melty cheese. My most recent experience was with the Ahogado torta made with pulled pork and served with a spicy tomato soup like sauce for dipping. I highly recommend getting the special if they have it as well. The price is $10-$12 for the torta, but you will feel as though you have eaten too much if you finish it. Bonus: My friend didn’t finish her quesadilla and I got to eat the last slice. I obviously shouldn’t have, but can’t see wasting good food. It was delicious. It even didn’t have meat, but that is always the one thing I would change. It’s Still Home Cooking if it’s Packaged and Microwaved, Right?